This podcast was written for the miniseries ‘Thrillers for Gentlemen’. I was looking at the kind of thriller or spy novel that was masculine without being brutal, written about men of a certain generation who understood the value of the gentleman’s club, and worked within its rules. 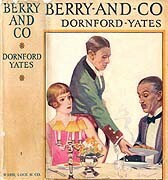 Fascinatingly, women were huge fans of Dornford Yates as well, and women’s magazines serialised his novels. 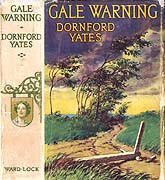 I couldn’t decide, originally, which one of Dornford Yates’s clubland thrillers of the 1930s to go for, so in the end I just took one from the shelf at random: Gale Warning, from 1939. The thing about Yates’s thrillers is that they are rather all the same. They have the same elements: the same impeccable handling of tension and plot twist, the same use of language, the same treatment of villains, and women, and heroes. But yet they are distinguishable. If I had told any one of the members of the Dornford Yates Yahoo group that this podcast was to be about the one where Plato put his hand down Audrey’s shirt and got in the way of a paperweight, they’d know exactly which one I meant. Each Yates thriller has its defining moments, and they are usually to do with the moment when something has changed the atmosphere, someone has acted in a way that has changed the plan. Gale Warning (1939) begins with a classic Yates jolt to the stomach, a twist in the hero’s personal fortune that is designed to show you his character, and the kind of world he moves in, without doing anything so clumsy as ‘telling’. The narrator, John Bagot, lost his parents young, and thus also lost his home, since his father’s job as land agent came with the house. His best friend George offers him the job he was ‘bred’ to take up, as a land agent. Note: Yates uses the vocabulary of animal breeding in relation to the natural aristocracy that his characters represent. So if anyone in his books is described in terms of the studbook, you know that he expects you to approve of them, and to emulate their actions. So John is offered a job as land agent by George, who is the Earl of St Omer, on his estate, which is called Peerless. Sorry, another note: Yates’ noble characters are often seriously noble, or ridiculously antique in their lineage. He invents titles with no discrimination at all, using the most outrageous nouns as proper names for estates and families. These are deviously manipulative in their emotional effect on the reader. 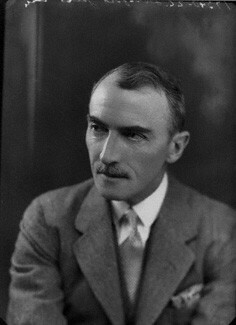 If an estate is called ‘Peerless’ the reader knows immediately not only that it is the best of its kind, but also that it is inhabited by antique gentry who use antique vocabulary, indicating that they come of a very long line of descent, and that that automatically makes them good. So John now has a job that he will take up in six months’ time. He is grateful, and determined to do the best for George and Peerless, so he decides to blow all his savings on a training course in the technical aspects of his profession. He can’t start the job any sooner because the agent currently in place has been given six months’ notice after being caught stealing. George won’t sack him immediately because that would wreck the man’s future: that’s the kind of man George is. The six months pass, and George sends John a telegram to invite him for dinner at Scott’s in London, to celebrate the start of their association. John arrives at the restaurant first, orders a newspaper, and sees on the front page the announcement of George’s death in a road accident en route to London. So now he has no job, he’s lost his best friend, and he only has 20 pounds left in the world because he’s spent his savings on the land agent training. Up, down, up, down. That’s how Yates constructs the first four pages of the first chapter. John hears a man at the restaurant door asking if there is an alcove table, and gets up to vacate his own, since there is now no point in his staying. When he pauses at the restaurant door to button his coat against the wet night (actually it’s a ‘rough, wet night’: Yates uses metaphors like confetti to point up the messages of emotional melodrama), he is stopped by the man who had spoken, who knows exactly who he is, and who also knew George. This is Jonathan Mansel, Yates’ great thriller hero, and now that he is on the stage (another Yatesian trope: he does like to present his novels as populated by actors in a staged setting), the audience can settle down knowing exactly who is in charge, and enjoy the ride. Mansel is Captain Mansel, so we know he is of impeccable bravery and has gentleman thriller qualities because he is an ex-officer. Any ex-officer in a Yates novel is automatically good, and a hero as well. It’s not a debateable point, and it can be quite reassuring to know these fixed points of certainty in the shady world of crooks and villainy without the law that Yates writes about. Jonathan, or Jonah, Mansel is also one of the Berry crowd, the strange, incestuously connected group of cousins who all live together in an infantilised world of devastatingly light humour (one day I will post the podcast that I wrote about them, in Adele & Co). Mansel is the hard man of that group, and called Jonah there, since they are all cousins together, but in the thrillers he is Mansel, as befits his commanding officer status. In the thrillers, Mansel is strong, stern and utterly in control. He’s also, technically, a criminal because his speciality is taking the law into his own hands. He keeps doing this, in book after book, because in Yates’ view, the police are useless, and vigilantism is the only way to deliver a good thriller. Mansel is friends with all the top policemen so he can call on them when he (very rarely) needs a safety net, but this is not always possible, and going ‘without’ the law is always his favourite option. Now that Mansel has taken over the plot of Gale Warning, John can relax too. Naturally he is distraught about George, and is pathetically glad to be invited to join Mansel’s private vigilante scheme to kill the man who ordered George’s murder. It was a revenge attack for the foiling of a high-profile burglary of jewels that were stripped from the women’s necks at a private house party at which Royal personages were present. Here again we have some favourite Yatesian moments. Jewels are always more attractive than money as treasure, because money smacks of trade (not conducive for a gentleman), and jewels are shiny. Jewels are also usually around the naked body parts of women, and Yates takes enormous, lingering pleasure in ensuring that we can picture the scenes in which jewels are stripped (and they would be ‘stripped’, wouldn’t they?) from such arms or necks, because the threatened violation of women in a Yates novel is the one thing that will ensure the rapid and summary death of any villain, especially if Mansel is involved. Murders along these lines happen quite often in Yates’ thrillers. In Gale Warning the scene where the villain actually lays his hand on the woman’s skin is described in full to the reader: Yates wants us to feel pleasurably excited and also outraged. He had strong views about the rightful ownership and possession of women in his own life as well as in his fiction: he would not have been a pleasant man to know, I feel. So George, Mansel and Mansel’s great friend and fellow thriller hero Richard Chandos, foiled this jewel robbery, and its organiser arranged for George’s murder in revenge, telling Mansel that he and Chandos were going to be next. So naturally Mansel takes the offensive, and offers John the job of helping avenge George. Enter another player: George’s fiancée, Lady Audrey Nuneham. (Pause for another note: Audrey is the daughter of a duke or earl, since she uses her title with her first name. This makes her of the correct rank to marry an Earl, in Yates’s eyes, though any lady could marry a peer.) 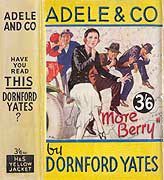 Audrey is a classic high-spirited, proud and sharp-tongued Yates heroine, who routinely says vicious things to the man she will eventually marry. She will be humbled by his devotion, and his ability to take all her tongue-lashing meekly, and she will be described in animal terms. She will be schooled, and brought to heel, in the most humiliatingly subservient, abased vocabulary, because Yates does enjoy giving out a good dose of abasement. His characters exist to glory in their hierarchies of value in relation to each other. They worship each other’s good qualities and praise each other in simple, soldierly steady-eyed English. Sometimes it’s all too much, too baroque and too selfless. Gale Warning continues to relate the hunting down of the first link in the chain of people who will lead Mansel & Co to Barrabbas, the criminal mastermind behind all the nastiness. We have some excellent episodes tracking the first man down in the City of London (some classic interwar City of London crime and trailing scenes here), and then a very long and seriously iconic episode of Yates writing about cars, and mapping, and navigation in northern France. We have the tense moments of closing in the prey, the recce, the tests of endurance, the stomach-jolting shock of surprise, aeons of high tension, the attack, and then the careful wiping away of the blood. It is marvellous stuff, nail-biting, and gentlemanly to the core. Also vicious, high-handed, chauvinist, rule-bound, and arrogant. It all depends how much you can take at one sitting. ‘Gale Warning’ isn’t my favourite of Yates’ thrillers, but I like Audrey a lot (even if I dislike the fact that she falls in love with John so quickly after St Omer is killed, but it was fairly inevitable). One of the things which makes the books appealing is the comradeship and loyalty between the (largely) male group of friends – Mansel, Chandos, and Hanbury in the earlier novels – even if many of their actions are reprehensible. Mansel does point out in a couple of the thrillers that he respects the police (and in a few of the short stories Yates actually does have policemen heroes who are very competent), but that he can do what they can’t – go up against criminals which the police can’t, for lack of evidence, or because, in their respectable lives, they’re above suspicion. 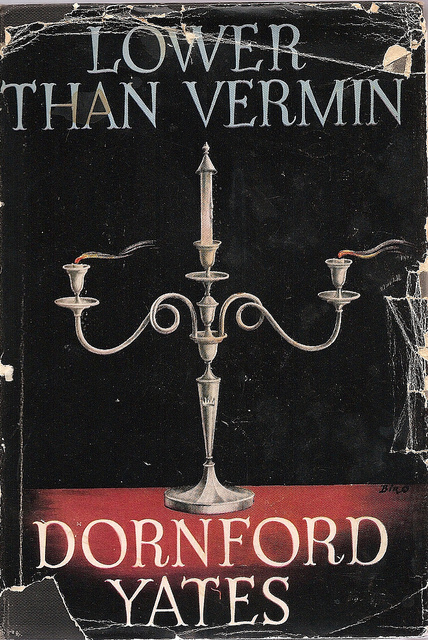 With respect to ‘Lower Than Vermin’, the books shows all too well what he thought of the upper classes. Vivien and Philip are meant to be the epitome of aristocratic virtues, but Philip comes across as weak and Vivien as cold, and most of the other characters exist to be foils to them. That said, he does manage some poignant vignettes – poor Mary and her horrible husband, for example. Lower than Vermin is the Yates I least want to re-read. I forced myself to work through it dispassionately when writing my book, because it’s so important as an expression of the later Yates interests, but it is simply horrible, in many ways.